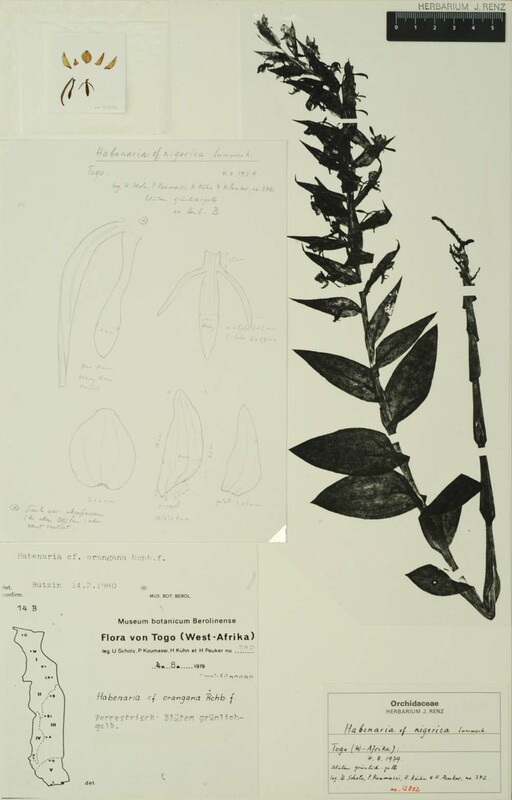 Found in senegal, Togo and Nigeria in open savanna and woodland as a small sized terrestrial with a rather stout, erct, glabrous, leafy stem carrying 6 to 7, increasing in size up the stem, longest just beneath the inflorescence, lanceolate to oblong lanceolate, acute leaves that blooms on an erect, terminal, 2.4 to 4" [6 to 10 cm] long, laxly several to many flowered inflorescence carrying yellowish green flowers . CAUTION!!! The collection sheet above is listed as Habenaria cf nigerica so it is not verified to be the species, so please use with caution!